Simply go to the taxi stand and ask for Sheraton Shenzhen Futian Hotel. Print the above bilingual hotel address with you and show it to the taxi driver. Provided below are the approximate distances, times and fees from the main transport centers to the conference venue. Time and fees are only for reference and will depend on the traffic situation. Shenzhen is a major city in Guangdong Province, China, which forms part of the Pearl River Delta megalopolis north of Hong Kong. It holds sub-provincial administrative status, with powers slightly less than a province. It is home to the Shenzhen Stock Exchange as well as the headquarters of numerous multinational companies. Shenzhen’s cityscape is the result of its vibrant economy made possible by rapid foreign investment since the institution of the policy of “reform and opening” in 1979. The city is a leading global technology hub, dubbed the next Silicon Valley. Shenzhen is also a tourist destination known for attractions such as the China Folk Culture Village, Window of the World, and Chung Ying Street (a street dividing Shenzhen and Sha Tau Kok, Hong Kong). Shenzhen’s five ports make it very convenient for tourists to visit Hong Kong. The Shenzhen 5-day visa on arrival, also known as Shenzhen 5-day VOA, enables tourists from most countries to stay in Shenzhen for up to 5 days without applying for a regular visa. During the 5 days, tourists cannot leave Shenzhen for other mainland Chinese cities. Note that Shenzhen VOA can neither be extended nor converted. Holders should leave China before it expires. The 5 days start counting from 00:00 the day following the entry date. For more information regarding visas, please visit Travelchinaguide.com/visas. 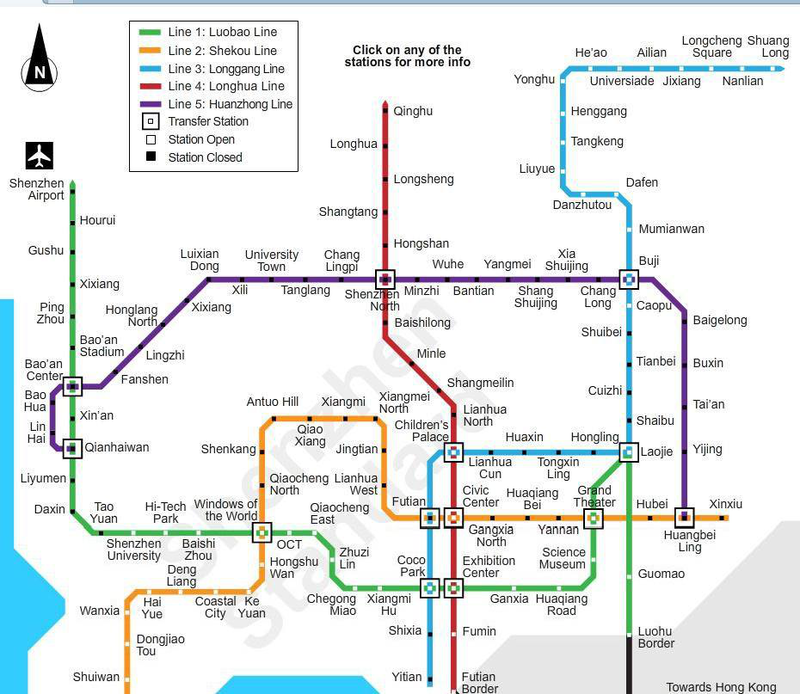 Subway: Eight subway lines are operating in the city so that the accesses to the major distribution centers like Luohu Railway Station, Window of the World, Luohu Port and Shekou Port are quite easy. City-bus: There are over 900 bus lines running in this city presently. Regular bus lines, Express Lines, Intercity Lines, Night Lines, Peak Hour Lines and Holiday Bus Lines are the main categories. Most routes in downtown area cost CNY 1 for ordinary bus and CNY 2 for air-conditioned bus. Their operating hours are roughly from 07:00 to 23:00 in weekdays. Taxi: Currently, more than 16,000 taxis run in the city. They are mainly in four colors and serve designated areas: red and yellow cabs run in urban and suburb areas including Luohu, Futian, Nanshan and Yantian Districts; green cabs can only be found in Bao’an and Longgang Districts; blue cabs, namely electric ones, serve the same areas as the red ones. In the day time, the fare is CNY 6-10 for the first 1.2 miles (2 kilometers) and then CNY 2.4 for each extra 0.6 mile (1 kilometer). During the night (23:00-06:00 the next day), passengers need to pay extra 30% as night allowance. For more information regarding transportation, please visit Travelchinaguide.com/transportation. The Chinese Yuan, also known as Renminbi, is used throughout in mainland China, while in Hong Kong and Macau, the Hong Kong dollar and pataca are respectively used. “Renminbi,” which translates to “people’s money,” is the official currency of China. The basic unit of the Renminbi is the Yuan and the symbol for the Yuan is ￥, just as the symbol for the US Dollar is $. Currency exchange may be available in large banks, hotels, and airports. While the average restaurant, shop, and your hotel in China will likely accept major credit cards, it is always a good idea to carry a certain amount of cash on you at all times and try to make your purchases with such, especially if you are heading into a more rural or remote area of the country. Payments made by way of a mobile device are increasingly common and in China can be made through WeChat and Alipay. You will likely come across QR codes to make a mobile payment for a taxi, street vendor, or other merchant in many parts of the country. Apple pay exists as well, but is not supported by as many merchants as WeChat and Alipay. For more information regarding Chinese currency, please visit Chinatour.com. The consumption level in Shenzhen is basically the same as that in Beijing, Shanghai and Guangzhou. Compared with Longgang and Bao'an districts, which are located in northwestern Shenzhen, the price of Luohu, Futian, Nanshan and Yantian districts that are near Hong Kong are relatively high. Most of Shenzhen's parks and attractions, such as Dapeng Fortress, Shenzhen Mangrove Ecological Park and Dameisha, offer free entry. Tickets of theme parks and amusement parks represented by Window of the World are around 200 yuan. The high-rise themed sightseeing tour is around 100 yuan. Due to its subtropical climate, Shenzhen weather is mild with plenty of sunshine and rainfall all year round. Summer in this city usually lasts for as long as 6 months, but without being overly hot. In comparison, winter is very short and not cold at all. Autumn significantly falls on Shenzhen in November, accompanied by cool and dry weather. The average temperature is about 25°C (77°F) in day and 17°C (63°F) at night.